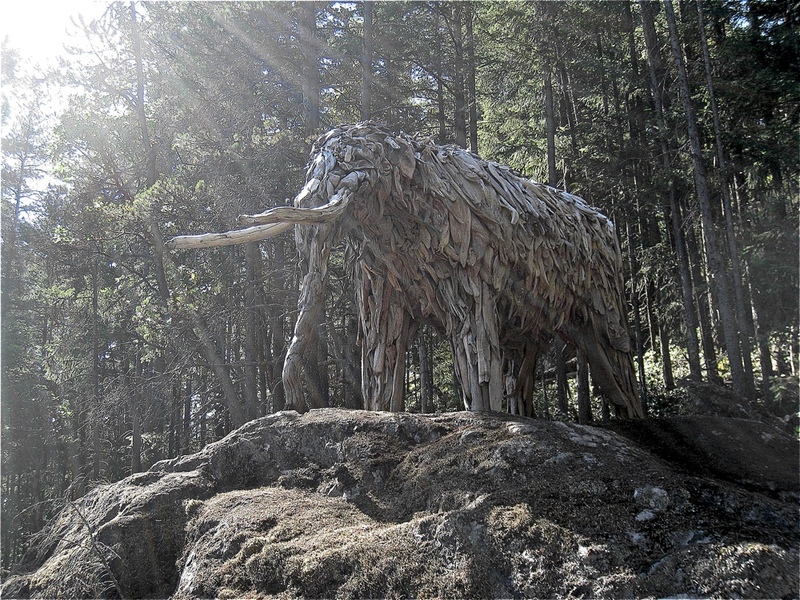 On Saturday, March 10, a small group of us were on a local mountain to visit the spectacular land sculpture of a life-sized mastodon. Click here for more information on this amazing sculpture. Please follow that link because it is a wonderful story — but this article is about what happened to me that day. And no, I’m not going to reveal its location. It was a lovely day, and after some time with the mastodon, we felt like doing a bit more off-piste exploring. And I made a serious error. In this blog you’ve read about my trading hiking boots for trail runners — that’s what I was wearing. Was it because I was on a familiar mountain, and not deep in the backcountry that made me careless? Whatever the reason, I found myself moving far too quickly through the thick underbrush. I must have put my foot in a hole, or slipped off a branch, but something hurt. By the time we regained the trail, I knew the foot was in trouble. Leaning on a ski pole, I limped off the hill. The next morning I took the foot to St Paul’s Hospital Emergency. First there were x-rays, then a CT scan, and the verdict was that this was a Lisfranc foot injury. 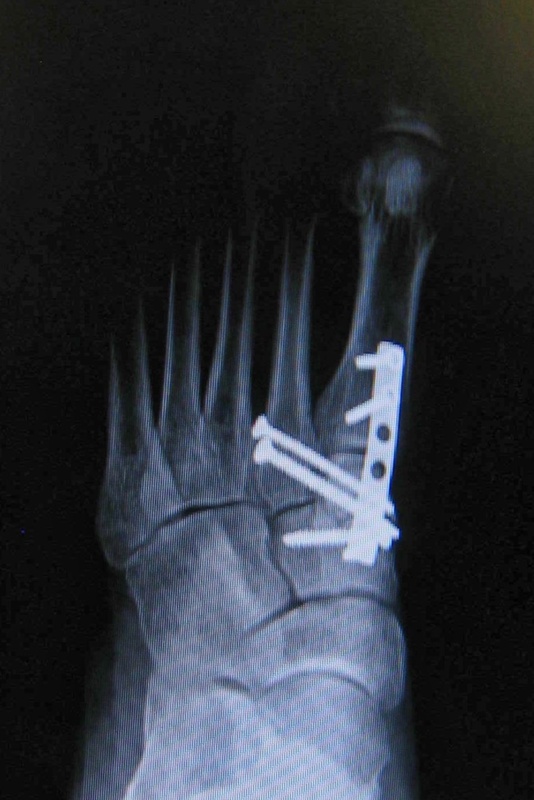 Essentially the bones between the ankle and the toes which are normally held in position by tendons and ligaments, were pulled apart and out of alignment. I was provided with a mighty boot to support the foot, and a pair of crutches — and told not to put any weight on the foot. I was given the name of a specialist. For my friends, and for the curious, I am prepared to show you what they did to me. If don’t like seeing the consequences of an operation, you may not want to continue with this article. The solution was to screw the bones back together. The operation was scheduled for 7:50am on March 26. I was returned to my family by 11am that morning. 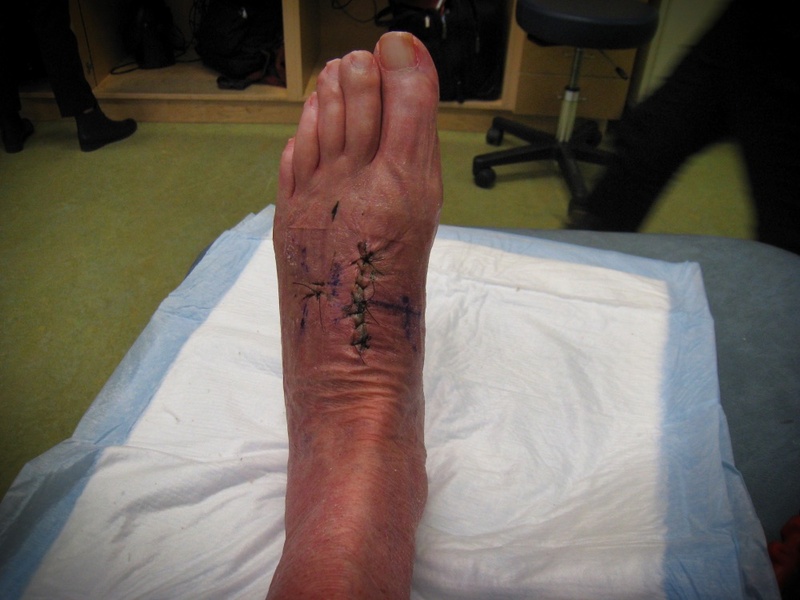 Yesterday, April 9th, was two weeks after the operation and I was due back at the hospital for them to examine my foot, and for me to find out exactly what they’d done. The word was that the foot is doing well. It will be 4 weeks until my next consultation. Until then, the foot must remain completely unweighted. Three times each day I’m to take the foot out of the boot and gently flex it up and down. After the 4 weeks I expect that I’ll begin to weight it. 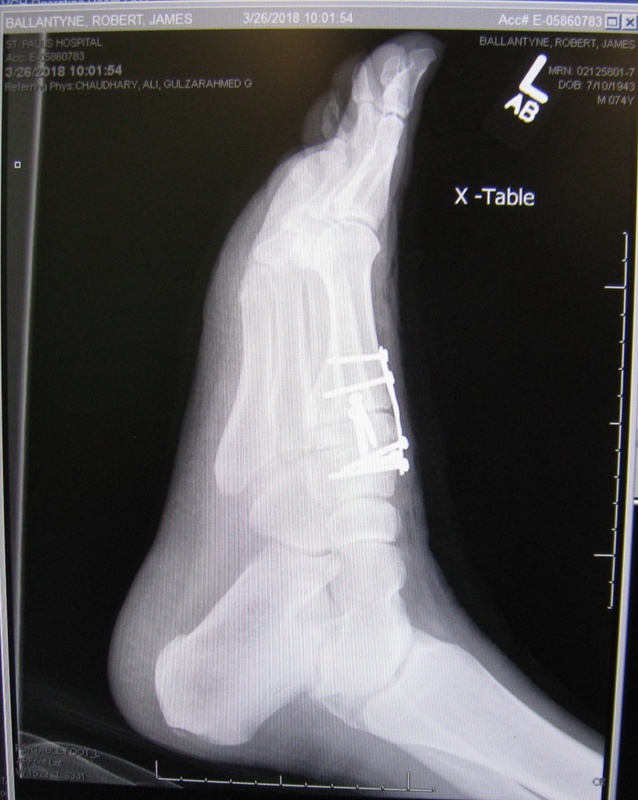 Sometime between 4 and 6 months there will be a procedure to remove some of the screws. I was warned that it will be over 6 months before I can consider hiking again. Here are the pictures. I found myself in the orthopaedic office of St Paul’s out-patient section, and surrounded by people receiving new casts, and having old ones removed. 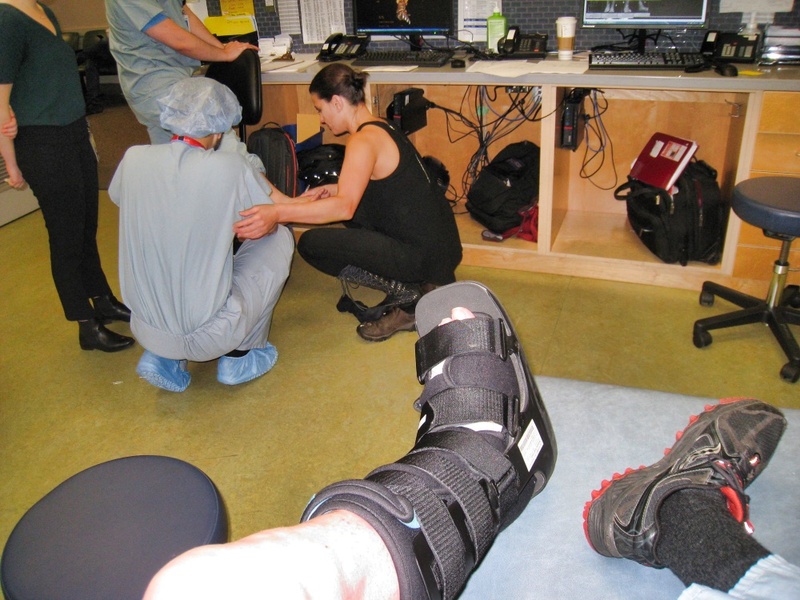 This is the boot that was given to me in Emergency. After the surgery, it was put back on my foot, and until this event, I’d never removed it. There are two incisions. The large one is between the bones of the large toe and the 2nd toe. There is a tiny one between the 3rd and 4th toe. I’m guessing that the small one is to access the horizontal screws. 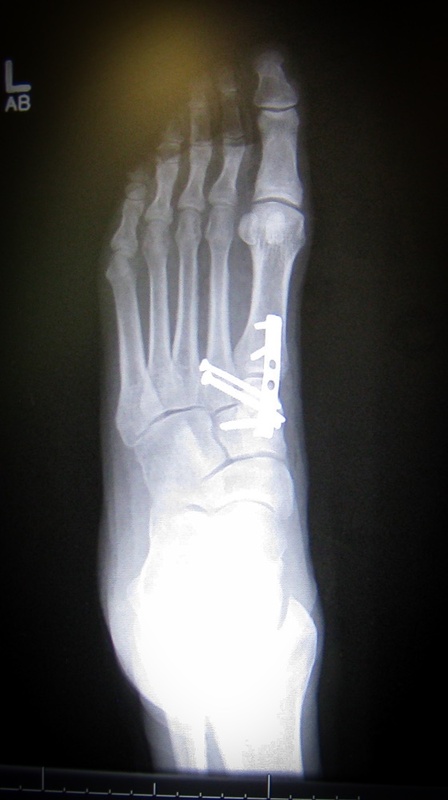 X-ray closeup of the left foot with the plate and screws. Yikes!!!!! Here’s to fast healing! Thanks Susan. I have great support from family & friends. It is going to take some time.